Some of you saw glimpses of my progress over the last few months. I can share the rest now! I started with a size 16 muslin - the largest size in the packet. The skirt would need no adjustment, as this is my usual skirt size and being 165cm tall, I'm about 'standard' height. My shoes only had small heels. adding extra fabric to the top, as this is quite low-cut by design. I didn't have to adjust the front any further. I basted it to the back muslin, which required a lot of fiddling. I had the assistance of a sewing aunty for the pinning! My back is very narrow relative to the rest of me (closer to a size 10-12), so the size of all the pieces was reduced proportionately. It was also a little bit lower than the top of my underwear, so I raised the top slightly. 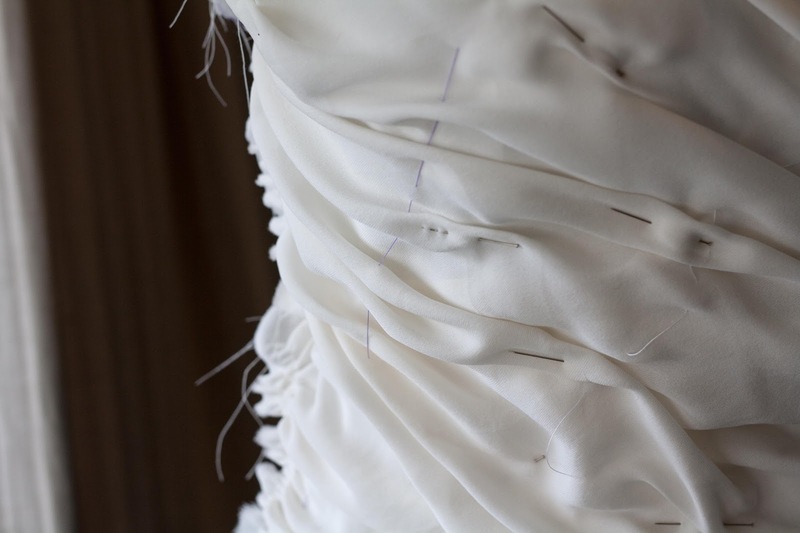 Then I chopped the muslin apart at the seams, and thread-traced it onto the silk. I cut it out with somewhat wider seam allowances in case the silk shifted or frayed. The sewing instructions were unremarkable. Mostly, I just followed them without too much fuss. The vast majority of the dress had to be hand-basted, and a reasonable amount had to be hand-sewn. The skirt was largely machine-sewn, and I stretched the narrow double-folded hem slightly while sewing to enable the ripply effect that I like. Luckily the silk felt lovely on my hands, because there was *a lot* of handwork involved. One major omission from the instructions is that you need to tack down the ruching. If you follow Vogue's instructions, you will end up with a very saggy, droopy bodice. I pinned each fold where I liked it, and then took some little stitches through to the underlining to hold it in place. Some of these stitches were augmented with Swarovski crystals, just for a bit of twinkly fun. It took me three tries to get this how I liked it, and took probably 15 hours in total! For a step that Vogue didn't even include, it sure did take a long time. Everyone has a different way of tackling a big project. I just grabbed time when I could (after work, on weekends), and aimed to cross off one step of the instructions each time. Literally. I photocopied them at the start and used a big red pen! It gave me a sense of achievement. How do you tackle a big ongoing project? Do you have any other questions about the dress construction? I'll be sharing a post soon about our elopement... a lot of people I've talked to are curious about why we would do it, and what the benefits and pitfalls are. It won't be the easiest post to write, so it might be a while coming! The ruched front looks absolutely gorgeous and I love that you added the crystals along the way. Thanks Katie. The beading was something I'd considered already, and Melanie (poppykettle) assured me that it was a good technique for holding the ruching in place. Ruching like this always has to be held down by little hand stitches - I used to always pin to make sure the fold was as I wanted it, then a tiny stitch. Then I would line the bodice later, so no little hand stitches showed. Sometimes you can get away without hand stitches if the ruching is pulled really tight- then I used to use a machine stitch through the middle - this was in the 80's. I prefer the soft look of the sort of ruching you have done. I always find that sort of handwork relaxing. Yes, that's almost exactly the ruching technique that I used. It seems like quite a big oversight from Vogue not to include it in the instructions (which were otherwise quite detailed). I can see how tight fabric would hold the ruching on its own - that makes good sense. It might not have worked well with the soft georgette, and certainly wouldn't have had the same effect. It would probably look great with a firmer fabric like taffeta or satin, and possibly with knits? I've never before attempted so much handwork... but it was quite relaxing, in a way! Yes, the tight ruching was taffeta - electric blue, jade, hot pink - it was the 80's. This would have been a great project to work on and the dress is gorgeous to look at. I hope you enjoyed wearing your beautiful dress. I did indeed love wearing it, thank you :-) It felt so lovely, and the whole dress only weighed a few hundred grams (despite 12 yards of fabric). I think I'm addicted to silk now! Your dress is gorgeous. I'd love to see more pictures from your wedding! Thanks Heather - there are a few more coming! Yup. Hand tacking ruching in place is a must every time I do it, too. And silk is so divine to work with it's hardly "work" to sew it by hand, even in copious amounts! I can't think why Vogue left that instruction out. 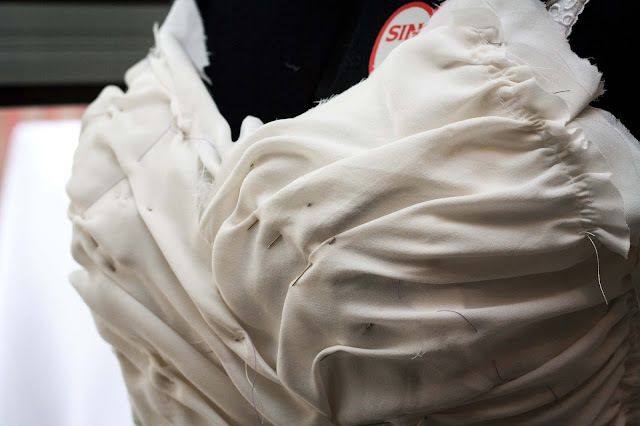 Even if a particular fabric doesn't need it, it's good insurance in case the ruching shifts. This is the first time I've worked with silk in any volume, and also the first time I've done a great deal of handsewing. It really was quite relaxing! Silk thread made the job so much easier, too.